Everything nuclear is now with a capital "N". Nuclear explosions are now better, bigger and deadlier. Credits are due where credits are due. No uncredited and/or commercial use authorized. BIG update v0.93 is here! 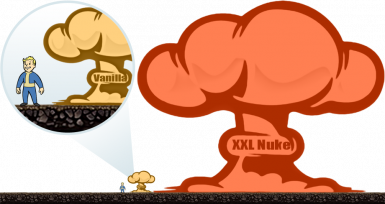 XXL Nukes is a mod that changes game's "nuclear" farts into proper means of Mass Destruction. 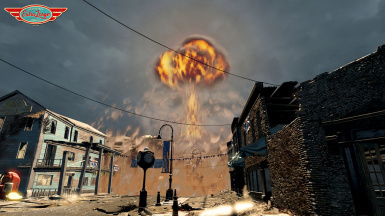 Blast radius, damage, animation, lighting and screen effects have been altered to make explosions look and feel more realistic. Plus it adds a custom Overcharged Mini Nuke to properly obliterate your foes. Explosions kill through obstacles (walls, fences, random pieces of cover, etc), deal more damage over a wider area while remaining totally usable, set targets on fire, induce radiation poisoning and more. Once you try this mod, you will never go back to vanilla, it just looks like a joke (maybe that was intentional?). Just make sure you save your game next time you decide to launch a Mini Nuke, and if you feel lucky, why not try running by a burning car. Nuclear Explosion damage type and radius diagram for OC1 Mini Nuke. + Removes the Immolation VFX (for people playing with cheats, eg. God Mode). Install after the main v0.93 file. This is the biggest update so far, it includes a lot of changes and tweaks as well as all new custom content. Keep in mind this still is a work in progress, more updates to come. 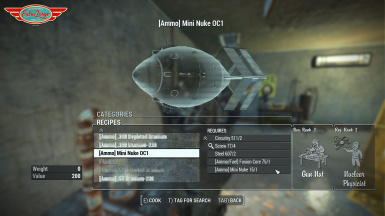 + Craftable Overcharged Mini Nuke. Recipe requires 1 Mini Nuke and 1 Fusion Core (Chem Bench under Utility). 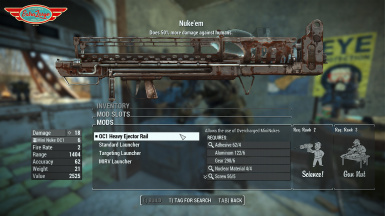 + Craftable OC1 Heavy Rail for FatMan (Weapons Workbench). + Custom explosion meshes, animations and textures. + Increased MIRV range and projectile spread. + Stock nuclear explosion animation now lasts longer. 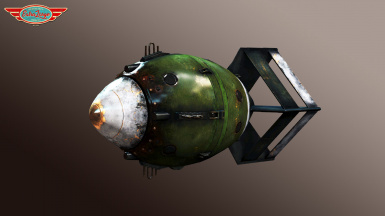 + Nerfed Mini Nuke explosion seen in previous version for balancing reasons, OC1 is king now. + Removed air raid siren sound effect. + ... some minor changes that I can't remember. Optional "XXL_Nukes_OPT No_AirRaidSiren.esp" (08-Jan-2017) EDIT: Obsolete. + Removes Air Raid Siren sound FX. Install after the main file. + Robot self destruct explosion obstacle penetration removed (for better indoor fights). + Extended fire duration for ash piles left on death (3min). + More damage! 2000 HP in 2s. + Added thermal and nuclear radiation to environmental explosions (vehicles, robots, etc). + Ash piles left on death keep burning for a long period of time. + Nuclear Blast radius of 30m, 1200 damage in 2s. + Thermobaric Blast radius of 30m, 1200 damage in 12s. + Thermal Radiation (fire damage) radius of 40m. + Nuclear Radiation (persistent radiation damage) radius of 50m. + Obstacle penetration. Fat Man and Nuka Grenade now deal damage to player and NPCs ignoring LoS (walls, fences, etc). + Visual and Sound FX updated. 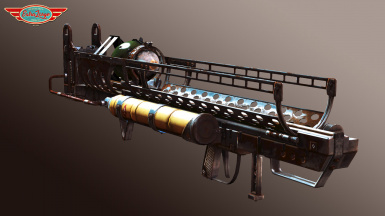 + Blast radius and damage: 1.5 - 4 times increase. 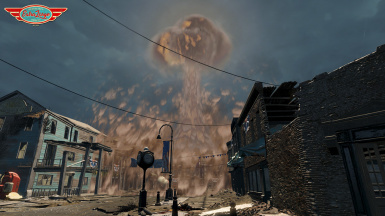 + Explosions overhauled: Fat Man / MIRV, Nuka Grenade, Vehicles, Sentry Bot, Liberty Prime Nukes, Bot Autodetonation. 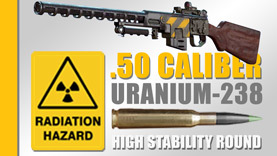 - Increased radius and damage for all ingame nuclear explosions. - Custom craftable Overcharged Mini Nuke (Chem Bench) with its own unique explosion animation. - Custom craftable OC1 Heavy Rail for FatMan (Weapons Workbench). - Increased MIRV range and projectile spread. 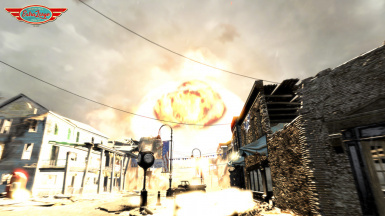 - Better nuclear explosion animations. - Improved visuals and sound effects. A. Download with Nexus Mod Manager (NMM) and install/uninstall in 1 click. B. Download manually and follow these instructions. 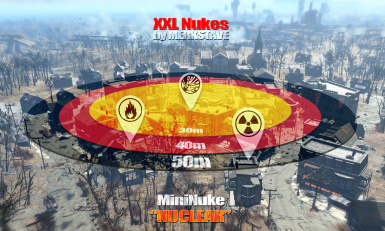 XXL Nukes will not work properly with other mods that alter explosions of Mini Nuke, Nuka Grenade, vehicles and/or robots. 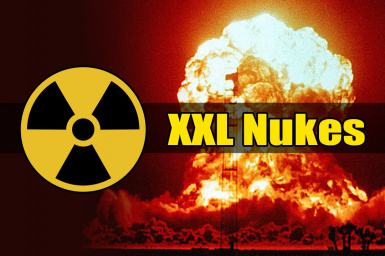 Make sure XXL Nukes is the last mod in your mod loading list in order to prevent conflicts with similar mods.